Do not grieve, do not be cross! Day of joy, have faith, will follow. What will part, will be a treasure. Oh, I am so glad you liked it! Thank you, Misky. This is Beautiful. Thank-you for the translation. that is so cool. We leave for a week of vacation tomorrow. See you when we get back! I'm so sorry. I've never had poison ivy myself, but I heard about it. The plant looks so harmless... Get well, have a great vacation no matter what! I giggled [not something I do] when I saw the portrait and went back to my site to read your reasons why this is a winter poem. Hysterical... the reasons, not the translation, which is lovely. 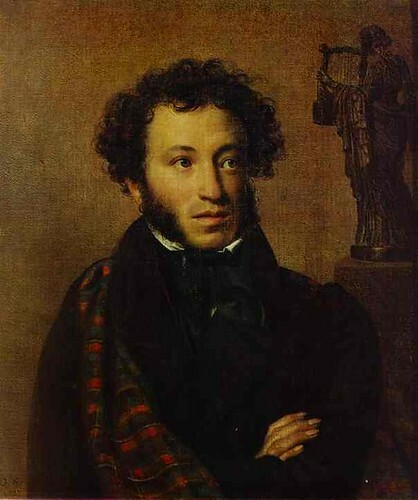 I don't think I have read Pushkin. Now I want to.